Check out all of the green we wore today! 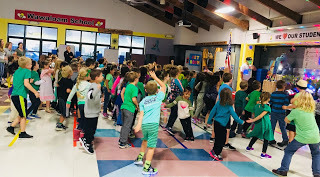 We started out with a spontaneous DANCE PARTY on Monday and everyone in the school stopped what they were doing and danced together to the song "Happy!" All week long we passed out reminders to Start With Hello. Students were randomly handed a piece of paper that said hello and were challenged by seeing how many people could pass that to each other while saying hello. We played songs about being kind to each other over the school intercom throughout the week- teachers shared ideas for songs that would serve as great reminders! Today, we invited everyone at school to wear something green to show unity in understanding the importance of including each other and doing something about it if we see someone alone. Also, thank you Mrs.Blake for organizing the Reading Pep Rally today for Grade 1 students! What a fun way to kick off our love and excitement for reading!